Vyacheslav Starodubtsev’s Mozart. 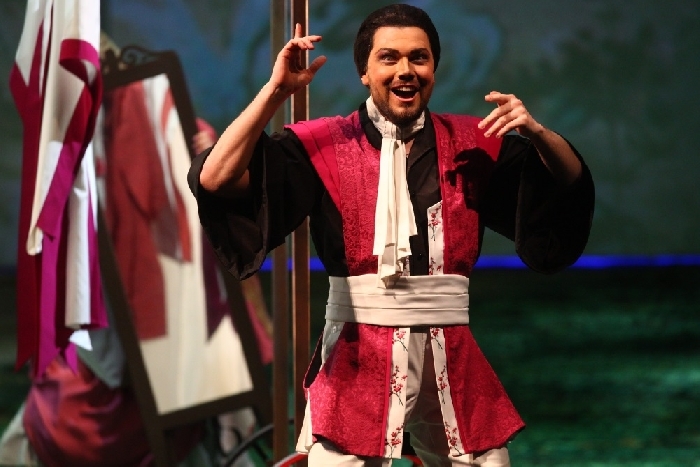 The Marriage of Figaro is brimming with oriental motifs, which are reflected too in the acting style. 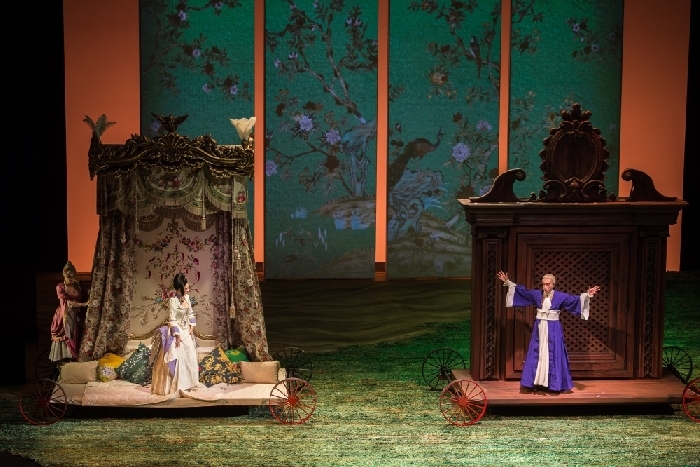 Working on one of Wolfgang Amadeus Mozart’s most important operas, the director has taken inspiration from the chinoiserie aesthetic that was so fashionable in European art of the late 18th century. This is a sophisticated offshoot of rococo style, drawing on the artistic traditions of Medieval China. Porcelain, coloured silks, sliding screens, and elegant tea houses tucked away in the depths of the garden were adopted as part of the European aristocratic lifestyle. Director Vyacheslav Starodubtsev makes no secret of the fact that visual content is just as critical for an opera director as the music. 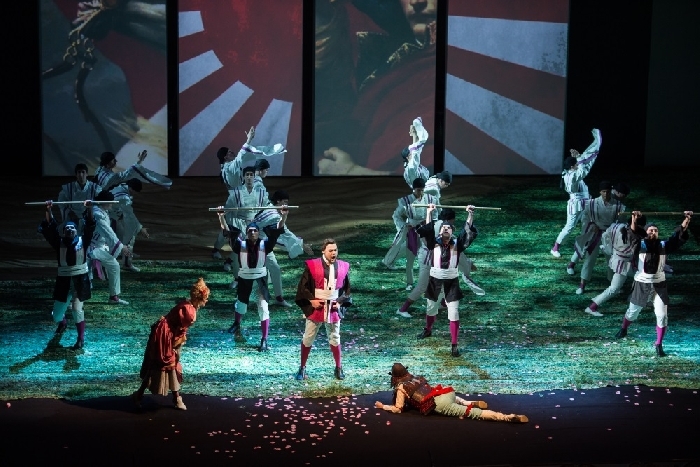 Along with production designers Zhanna Usacheva and Pyotr Okunev, he has decided to set the opera in a stately home, where oriental fashion not only has a bearing on the interior design, but also on the way of life. Act I On the morning of his wedding day, Figaro is measuring the room which Count Almaviva has “generously” placed at the disposal of the young bridal pair. His fiancée Susanna however appears much less grateful than her betrothed, because the Count has been making advances to her. His generosity is therefore by no means disinterested. Warned of the Count’s designs on Susanna, which Don Basilio, the music master, goes out of his way to encourage, Figaro does not lose heart: if the “signor Contino” wishes to dance, then he will dance to Figaro’s tune. The no longer young Marcellina is also keen to upset Figaro’s wedding plans, having in fact protested to Don Bartolo that she herself is entitled to marry Figaro, under the terms of a loan made to him in the past which he never repaid. Bartolo relishes the idea of revenge on the Count’s valet. The page Cherubino now enters to ask Susanna to intercede on his behalf with the Countess. The Count, having yesterday caught him alone with Barbarina (the young daughter of the gardener Antonio), has dismissed him from his service. But the sudden entry of the Count forces him to hide and to witness against his will the gallantries addressed by the Count to the maid. But then the Count, too, has to hide from Don Basilio, who has appeared unexpectedly to tell Susanna of the page’s flirtations with the Countess. Driven by jealousy, the Count emerges from his hiding-place and in the ensuing turmoil discovers the page and flies into a rage. At this point a chorus of peasants approaches and, on Figaro’s instructions, thanks the Count for having abolished the notorious privilege of ius primae noctis. On a trivial pretext, the Count postpones the wedding day and orders Cherubino to leave at once for Seville, to enroll as an officer in his own regiment. Act II Susanna tells the sorrowful Countess of the impertinence that she has been receiving from the Count. Figaro enters and outlines his plan of action. Meanwhile, to confuse the Count, he has sent him an anonymous note, informing him that the Countess has arranged a secret meeting that evening with an admirer. He now proposes that Susanna pretend to agree to meet the Count, but Cherubino (who has not yet left) will go in her place, dressed as a woman; the Countess will unmask her husband and catch him in the act, and the interests of all will be satisfied. While the page is preparing his disguise, however, the Count suddenly enters. His suspicions are aroused by noises from the next room (into which the Countess has shut Cherubino), so he decides to break open the door. But Susanna manages to let Cherubino escape through the window and to take his place just in time. When Susanna comes out of the cupboard instead of Cherubino, the Count is forced to beg forgiveness from his wife. Figaro enters, hoping by now to hasten his wedding ceremony. But Antonio also bursts in, saying he has just seen someone jump out of the Countess’s bedroom window. Figaro tries to parry this blow by saying it was he who jumped. But to crown the confusion, Marcellina enters to claim her rights, since she is now in possession of all the necessary documents to compel Figaro to marry her. Act III The Countess urges Susanna to accept a rendezvous with the Count, but the latter realizes he has been tricked and promises revenge. 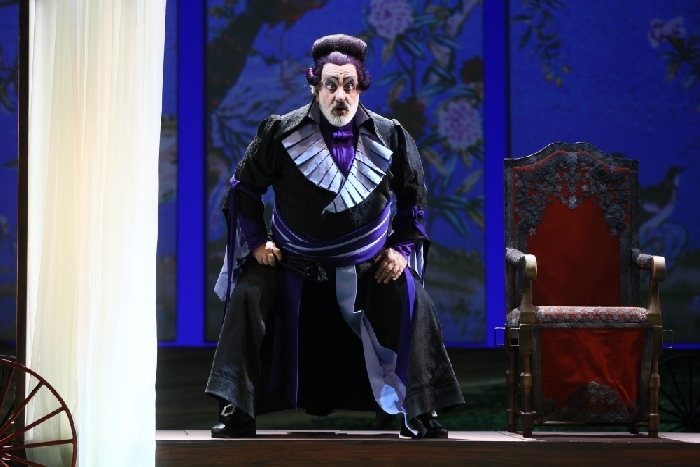 Don Curzio, the lawyer, enters and declares that Figaro must either repay his debt or marry Marcellina. But a birthmark on the young man’s arm reveals the incredible truth: that Figaro is the fruit of a former liaison between Marcellina and Bartolo. Mother and son embrace. The Countess expresses her sorrow and vows to recapture her husband’s heart. Accordingly, she dictates to Susanna a note, to be delivered to the Count, in which she arranges a nocturnal rendezvous with him, fastening it with a pin. Acting alone, the two women have decided to perfect Figaro’s plan. The Countess in person, and not Cherubino, will meet the Count instead of Susanna. While the chorus of peasants enters bearing garlands for the Countess, Susanna hands the amorous note to the Count, who pricks his finger on the pin. Figaro is amused, having not in fact seen who gave the note to the Count. Now the two bridal couples celebrate: Susanna and Figaro, Marcellina and Bartolo. Act IV Night has fallen and in the darkness Barbarina is looking for the pin which the Count told her to return to Susanna. Figaro realizes that the note received by the Count in the previous scene had been delivered to him by his own future bride. Thinking he has been betrayed, he hides in the garden to surprise the lovers. Meanwhile Susanna, unseen, has heard Figaro’s rebukes and is hurt by his lack of trust in her. She decides to keep him on tenterhooks. Enter the Count, with the woman whom he believes to be Susanna but who is actually the Countess in disguise. They all get lost in the darkness. Even Cherubino pesters the Countess, believing her to be Susanna. The Count loses his temper when he thinks he has seen Figaro courting his own wife, or rather, Susanna disguised as the Countess. In the end the muddle is unraveled. Figaro apologizes to Susanna for having doubted her faithfulness to him, and the Count implores forgiveness from his wife. At last the marriage between Figaro and Susanna can go ahead and the “day of folly” ends in jubilation.